The Wood pellet production line ordered by Philippines customer has been completed, the customers arrive at our site inspection today,the production department manager Mr Meng has given warmly reception. Both sides in the reception room on project progress did further communication,Mr. Meng provided the equipment list, including the models and volume of parts, auxiliary fan, motor, reducer specifications and parameters, main drum material certificate and parameters, the customer is very pleased with our equipment production efficiency, meanwhile they hope the equipment will work online as soon as possible. after the simple communication of project, accompanied by Mr.Meng,they went to working shop for inspection of equipment, they pay great praise for the equipments, customers also thank for our workers' hood working attitude. 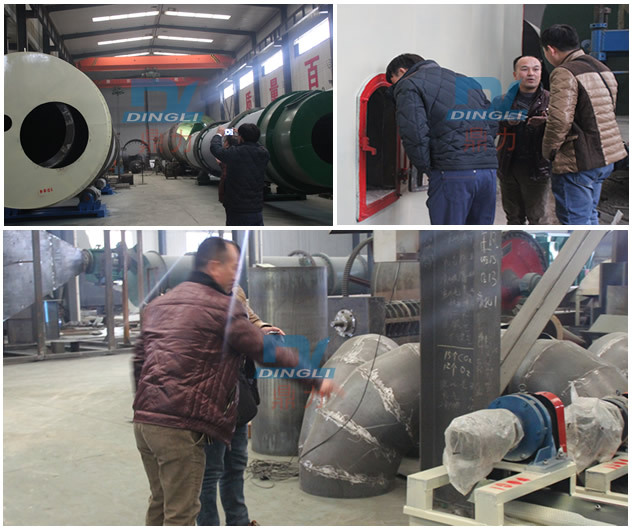 Zhengzhou Dingli Drying Equipment Co.,Ltd is mainly focusing on the research and manufacture of biomass pellet fuel production equipment such as rice husk pellet,sawdust pellet etc. kitchen waste processing equipment, coal (coal slime) drying equipment and feed drying equipment.Welcome your visit at any time.